A smartwatch is capable of detecting and distinguishing a variety of taps, flicks and scratches by the hands and fingers, and all that's required is a software upgrade that repurposes the device's existing accelerometer, Carnegie Mellon University researchers discovered. 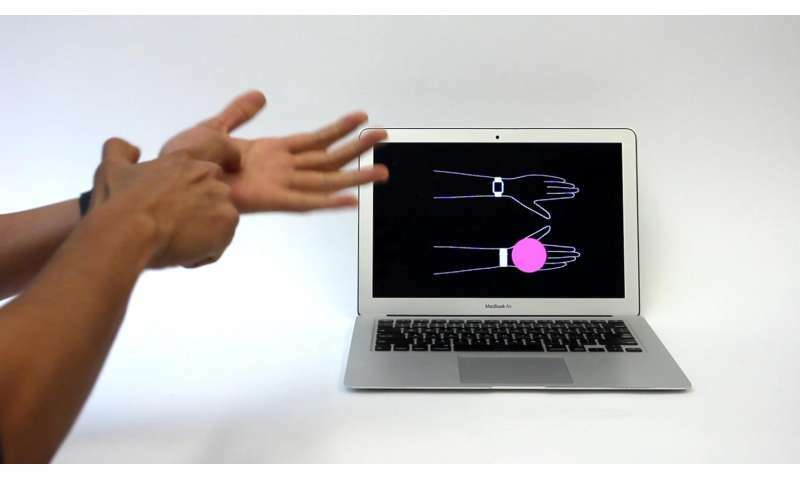 "It's as if you're using your hand as a detection device," said Gierad Laput, a Ph.D. student in the Human-Computer Interaction Institute (HCII), suggesting totally new uses for smartwatches. "The hand is what people use to interact with the world." This new technology, dubbed ViBand, was developed by Laput and Robert Xiao, both Ph.D. students in the HCII's Future Interfaces Group, along with their adviser Chris Harrison, assistant professor of human-computer interaction. They will present a paper describing the work at the Association for Computing Machinery's User Interface Software and Technology (ACM UIST) Symposium this week in Tokyo. "ViBand isn't just a way to control your smartwatch," Harrison said. "It enables you to augment your arm. It's a powerful interface that's always available to you." To increase the frequency of the accelerometer's sampling rate, the research team developed a custom kernel—the core of the smartwatch's operating system. That's the only modification required and can be performed as a software update, Laput said. Finally, they propose an application using what they call a vibro-tag, which is a small object that emits inaudible, structured vibrations that contain data. A vibro-tag on a person's office door, for instance, might transmit information about office hours or alternative contact information.